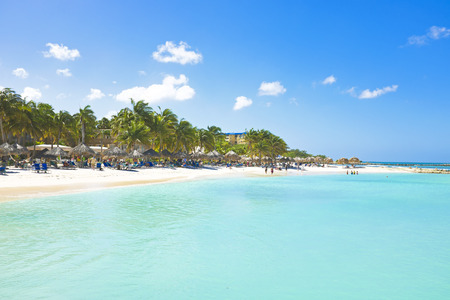 Aruba is a 33 km-long island of the Lesser Antilles in the southern Caribbean Sea, located 27 km north of the coast of Venezuela. Together with Bonaire and Curaçao, it forms a group referred to as the ABC islands of the Leeward Antilles, the southern island chain of the Lesser Antilles. Unlike much of the Caribbean region, Aruba has a dry climate and an arid, cactus-strewn landscape. This climate has helped tourism as visitors to the island can reliably expect warm, sunny weather. Temperature varies little from 28 °C, moderated by constant trade winds from the Atlantic Ocean. Yearly precipitation barely reaches 500 mm, most of it falling in late autumn. Regardless of whether you decide to go inland or heading out to sea, Aruba Fishing Guides or Aruba Fishing Charters make certain that your fishing venture is at the bare minimum an enjoyable and inspiring one, and provides you the greatest possibility to bring home a fish. I fished with Captain Mike Wever on Sat. April 23, 2016.
had a great trip… tried looking him up on facebook and youtube and NOTHING. The charter boat Kristel sail from the dock behind the MOOMBO Bar & Grill. Looking for contact information its not on his business card. I had a GREAT trip, Black Fin Tuna, Wahoo, Barracuda and a Mako that came out of the water with one of my tuna in his mouth. Yes, Aruba has some amazing sport fishing, not to mention island beauty and a rich, colorful culture. I think the FB page you are looking at is an old one. Try this page, you might find some info for Captain Mike. Thanks for sharing your experience with us. And someone tell the Captain he’s gotta put his contact on the business cards :).